Frankie Dettori’s Magic Seven is played on five reels and 25 lines, and it features clean and straightforward graphics that may seem a bit dull at first sight. However, as soon as Frankie’s smiling face starts appearing and bringing you nice rewards, your affection for this excellent game will increase. Apart from three Frankie symbols, one of which serves as a wild, there are also various theme-related symbols such as trophies and horseshoes, as well as standard poker symbols. In addition to the wild symbol, special features also include two bonus rounds – one with instant prizes and one with free spins, multipliers and scatters. In terms of money, the slot really doesn’t require much to be played. This means that it offers a whole range of betting amounts, with coin denominations going from $0.01 to $0.50, and the possibility to place up to 10 coins per line. 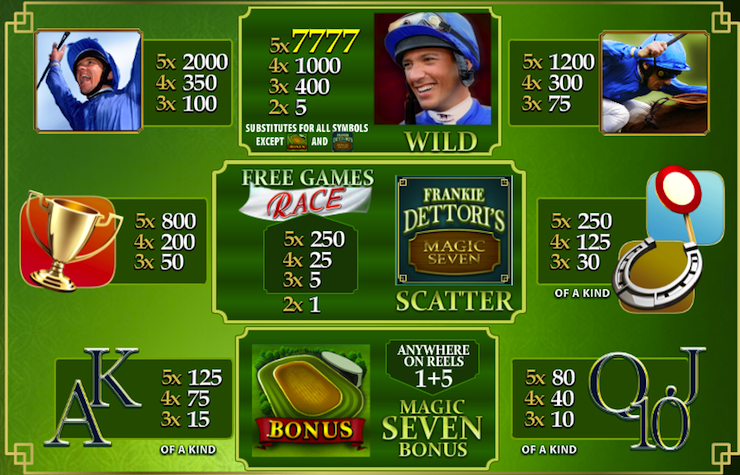 Thereby, Frankie Dettori’s Magic Seven is available to everyone, high-rollers and low-rollers equally, allowing them all to enjoy an authentic game which awards some exquisite prizes. Most of the above mentioned prizes can be won with the help of special features. Those include a wild Frankie Dettori symbol, which replaces all other regular symbols and forms winners, as well as a scatter and a bonus symbol. The scatter symbol triggers free games race feature when three or more of them appear anywhere on the reels.